I prepared a graph which I think nicely illustrates the simple point you made in your blogpost on the spurious association between SES and test scores. The graph is attached. The dataset is comprised of a large sample of men born in Sweden between 1955 and 1970 who took an IQ test at conscription, at the age of 18. Income is measured as the biological father's income in the 1970 census. The red line is the average measured IQ of the non-adoptees, plotted against the biological father's income decile. The blue line shows the same relationship for adoptees and their biological fathers. 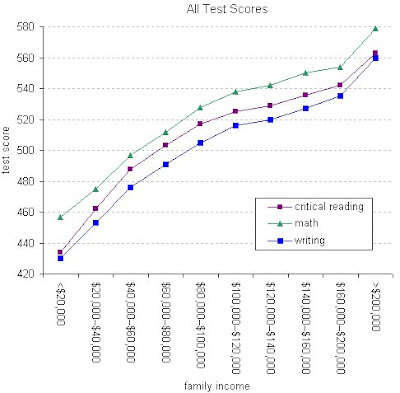 The patterns are remarkably similar,even though the biological fathers of adoptees did not raise these children.The fact that the biological father's income is almost an equally strong predictor of a child's test scores even when the biological father was not present in the household clearly suggests that most of the association between income and test scores does indeed arise because of omitted variable bias. Of course, an important caveat here is that it is quite likely that non-random assignment of adoptees may explain some of the similarity between the two lines. N.B. : What David has provided us is the complementary graph to the one I proposed in my post. I conjectured that if we graphed adopted kids' test scores against their household income--that is, against their adopted parents' income--the curve would be "a lot flatter" than it is for non-adoptees. David graphs adopted kids' test scores against their biological father's income and finds it is almost as steep as for non-adoptees. I am teaching a Harvard freshman seminar this semester (in addition to ec 10), and one of my first tasks is to choose the 15 students. About 200 applied. That means that getting into my seminar is about as hard as getting into Harvard--except that you first have to get into Harvard before you can even apply! Having spent much of yesterday reading through the applications, I fully recognize how difficult and somewhat random such admissions processes are. I could fill almost the entire seminar with kids with perfect SAT scores (2400), but I won't, as there is more to life than test scores. I am looking also for passion about the subject, interesting life experiences, and a balance among the group of students to promote good discussion. But judging that from a few brief essays is very, very hard. To those students I do not pick: I am sorry, and it is my loss as well for not having the opportunity to get to know you better. All the students will be taking ec 10 concurrently (or have already passed the Advanced Placement exam in economics). Update: At the students' behest, Superfreakonomics by Stephen Dubner and Steven Levitt was added to the list of readings. My previous blog post on SAT scores and income generated a surprising amount of blogosphere pushback. See, for example, this post by Paul Krugman. I say "surprising" because I almost did not post the piece at all, thinking that it was a bit pedantic and pedestrian. In other words, a big yawn. I did not think my point about omitted variable bias was particularly new or controversial. 1. People vary in their innate talents, as measured by, say, IQ tests. 2. More talented people tend to earn higher incomes. 3. More talented people tend to have more talented biological children--that is, talent is partially heritable. 4. As a logical implication of the above three points, the raw correlation of kids' SAT scores and family income conflates the true effects of family income with the biological transmission of talent. I would be curious which of the above four statements Paul does not agree with. Paul himself is a good case illustrating my point. He is smart, and he has high income. I don't think those two facts are a mere coincidence. Instead, his innate talent is a large element of his success. I would bet that if he had had children, they would likely have been smart as well, even if he spent only average resources rearing them (such as, for example, if he put them up for adoption). By the way, the conjecture in the final sentence of my last post about adopted kids was in part based on existing evidence in the nature-nurture debate. See, for instance, this paper. I am delighted that President Obama has decided to reappoint Ben Bernanke as chairman of the Federal Reserve. While there is certainly room for reasonable people to question some of the specific decisions Ben has made, in general he has led the Federal Reserve System with humility, intelligence, wisdom, and grace. I extend my congratulations to the President for a fine decision and my condolences to Ben for having to spend the next four years overworked and underpaid. If you are thinking about being a professor, read this (unless it is too late to turn back). Thanks for Craig Newmark for the pointer. Before you read this story, here is one number you need to know: the U.S. federal government's debt is now about $7.4 trillion. 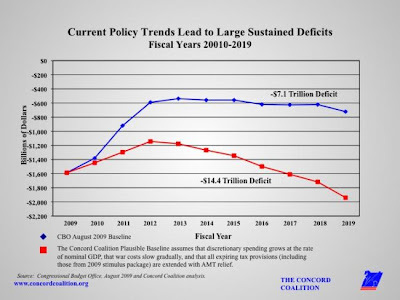 That is the accumulation from past budget deficits. The nation would be forced to borrow more than $9 trillion over the next decade under President Obama's policies, the White House acknowledged late Friday, bringing their long-term budget forecast in line with independent estimates. The new projections add approximately $2 trillion to budget deficits through 2019. Earlier this year, the administration had predicted that Obama's policies would require the government to spend $7.108 trillion more than it collects in tax revenue over the next decade. An administration official, speaking on the condition of anonymity because the report will not be formally released until Tuesday, said the change is due primarily to updated projections of economic growth that are far less rosy than data used when the White House released its first long-term budget outlook in February. A long but thoughtful article, recommended by a physician and regular blog reader. Not for the first time, as an elected official, I envy economists. Economists have available to them, in an analytical approach, the counterfactual. Economists can explain that a given decision was the best one that could be made, because they can show what would have happened in the counterfactual situation. They can contrast what happened to what would have happened. No one has ever gotten reelected where the bumper sticker said, "It would have been worse without me." You probably can get tenure with that. But you can't win office. 1. I express some doubt about the administration's economic forecast because it assumes a trend-stationary processs for GDP rather than a process with a unit root. 2. Paul Krugman accuses me of "deliberate obtuseness." The historical evidence is worrisome, however. The IMF’s forthcoming World Economic Outlook presents evidence from 88 banking crises over the past four decades in a wide range of countries. While there is large variation across countries, the conclusion is that, on average, output does not go back to its old trend path, but remains permanently below it. The possible good news is that the trend itself appears to be unaffected: on average, crises permanently decrease the level of output, but not its growth rate. So, if past is prologue, the world economy likely will return to its past growth rate. But, especially in advanced countries, the period of above-average growth, characteristic of normal recoveries, may be short-lived or nonexistent. What Olivier is saying is that the shocks to the level of GDP from banking crises are typically permanent. That is, in econometric terms, there is a unit root. Of course, Olivier could be wrong. But I am pretty sure that he is not guilty of "deliberate obtuseness." By the way, the administration's midsession review, with its updated forecast, should be coming out soon. Will Team Obama continue to forecast a rebound to the previous trend path, as they did earlier in the year, or will they change their view and take to heart the kind of evidence Olivier describes above? Either way, it will be noteworthy. Harvard's Martin Feldstein opines on the President's health reform efforts. California's fiscal crisis is giving Tom Campbell, an ex-congressman with few resources, a fighting chance to become the state's next governor....Democrats scorn his ideas for permanent cuts to welfare and social services in lieu of one-time fixes, while Republicans strongly oppose his proposal for a steep increase in the state's gasoline tax....Armed with a University of Chicago doctorate in economics and a Harvard Law School degree, he represented Silicon Valley for five terms in the U.S. House, served as business-school dean at the University of California, Berkeley, and also as the state's finance director under Gov. Arnold Schwarzenegger. Here is Richard Thaler on the public option in the healthcare debate. He ends up about where I am on this topic, but I think he is a bit too quick to "assume that the public option does have to break even and can’t make any special deals." I believe that many advocates and many opponents of the public option are making the opposite assumption and, as a result, see the public option as a route toward a single-payer system. (They disagree, however, about whether that is good or bad.) That implicit assumption is why the public option is a bigger issue in this debate than Thaler would have us believe. For Russians, "ekonomicheski krisis" with its conceptual, foreign sounding roots conjures up half-Marxist, half-Mankiw notions gleaned from university cheat sheets. Within a few years, western governments will have to sharply raise taxes, inflate, partially default, or some combination of all three. In the 1960s, a University of Wisconsin graduate student named Thomas Crocker came up with a novel solution for environmental problems: cap emissions of pollutants and then let firms trade permits that allow them to pollute within those limits. 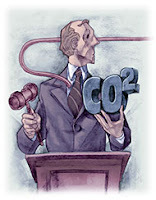 Now legislation using cap-and-trade to limit greenhouse gases is working its way through Congress and could become the law of the land. But Mr. Crocker and other pioneers of the concept are doubtful about its chances of success. They aren't abandoning efforts to curb emissions. But they are tiptoeing away from an idea they devised decades ago, doubting it can work on the grand scale now envisioned. Mr. Crocker, who went on to become a professor at the University of Wyoming, is one of two economists who dreamed up cap-and-trade in the 1960s. The other, John Dales, who died in 2007, was also a skeptic of using the idea to tame global warning. Steven Landsburg offers a thought-provoking commentary on my recent Times column. the evidence suggests that for most preventive services, expanded utilization leads to higher, not lower, medical spending overall. Coverage of the issue here and here. In the last few years, I have had the opportunity to compare the human and veterinary health services of Great Britain, and on the whole it is better to be a dog. The latter is the fear that also haunts Americans, at least those Americans who think of justice as equality in actual, tangible benefits. That is the ideological driving force of health-care reform in America. Without manifest and undeniable inequalities, the whole question would generate no passion, only dull technical proposals and counterproposals, reported sporadically on the inside pages of newspapers. I have never seen an article on the way veterinary services are arranged in Britain: it is simply not a question. Nevertheless, there is one drawback to the superior care British dogs receive by comparison with that of British humans: they have to pay for it, there and then. By contrast, British humans receive health care that is free at the point of delivery. New construction averaged over 200 houses per year until the slowdown started in 2006, providing a high level of income and steady year-round employment in the construction trades.... In 2007 the annual rate was slower than in recent years, at 127. The construction slowdown continued in 2008, with just 64 new homes, the lowest number since building permits were first required in 1972. Thus far in 2009 the rate is less than half that of last year, with 12 permits issued through June. Here is a piece of news I am sure you all have been waiting for: the latest winners of the Australian Awards for Excellence in Educational Publishing. Congratulations to Joshua Gans, Stephen King, and Robin Stonecash for winning the Tertiary (Adaptation) Teaching and Learning Category for for the Australian adaptation of my Principles book. I went to a great Jason Mraz concert last night. (Great, that is, except for the loud, drunken couple with seats directly behind us--talk about negative externalities!) If you don't know who Jason Mraz is, click here. But the real surprise of the night was an excellent warm-up act, K'Naan. But the fact that he mistakes his ignorance for a fact about the universe makes me wonder if pharmacoeconomics is what my college boyfriend's roommate used to do with a few grams of cocaine and a copy of Mankiw's Principles. It is always nice to see my product get new uses. By the way, the entire post, which is on the benefits of Big Pharma, is worth reading, as is most of Megan's blogging. If you have a spare hour and a half, watch this video to see one of my favorite economists testifying in front of the Senate budget committee on the topic of health reform. Health Reform: Simple or Not? Contrast the commentary of Paul Krugman and Keith Hennessey. To Paul, the administration's health plan is simple and straightforward. To Keith, it is a nonstarter. Why do these two smart commentators reach such opposite conclusions? The essence of the difference, I think, is that Paul is mainly concerned with universal coverage and is happy to put off discussion of the government budget constraint to another day, while Keith is focused on how the reforms will be paid for and, in particular, on the administration's claim that a major goal of health reform is to put the government on a more sustainable fiscal path. A large part of the policy debate boils down to this: Are you more worried about the problem of the uninsured or about the long-term fiscal imbalance? There is a huge partisan gap on perceptions of the U.S. health care system. Seven-out-of-10 Republicans rate it as good or excellent, but only one-of-four Democrats agree. Among those not affiliated with either major political party, 53% rate the current system as good or excellent while just 18% say it’s poor. Over the past few months, as the health care reform debate has raged, confidence in the current system has increased significantly among Republicans and unaffiliated voters. There has been little change among Democrats. Just 28% say they are willing to pay higher taxes so that all Americans can have health insurance. Sixty percent (60%) are opposed. Those figures are little changed since May. Recent polling has shown that cost, not universal coverage, is the top concern about health care. Sen. Bob Corker came out swinging against the climate bill that the House passed in June. Lately Corker has been insisting that he won’t accept anything short of a climate plan that auctions 100 percent of pollution permits and returns the money directly to Americans, and his preferred approach would be a carbon tax. Tyler Cowen considers what monetary policy can do to get the economy going. For some related ideas, click here. The prevalence of obesity rose 37% between 1998 and 2006....Obese people spent 42% more than people of normal weight on medical costs in 2006. Americans are also more likely to be obese, leading to heart disease and other medical problems. Among Americans, 31 percent of men and 33 percent of women have a body mass index of at least 30, a definition of obesity, versus 17 percent of men and 19 percent of women in Canada. Japan, which has the longest life expectancy among major nations, has obesity rates of about 3 percent. The causes of American obesity are not fully understood, but they involve lifestyle choices we make every day, as well as our system of food delivery. Research by the Harvard economists David Cutler, Ed Glaeser and Jesse Shapiro concludes that America’s growing obesity problem is largely attributable to our economy’s ability to supply high-calorie foods cheaply. Lower prices increase food consumption, sometimes beyond the point of optimal health. The bottom line: Differences in healthcare costs and health outcomes, either over time or across countries, depend on a lot more than the national system of health insurance.